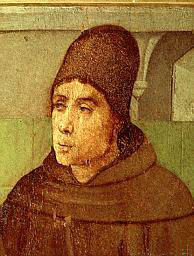 John Duns Scotus was one of the greatest of the medieval theologians. His penetrating scholastic theology earned him the nickname doctor subtilis (the subtle doctor). I myself have been very impressed by Scotus’s work on themes like freedom, volition, reason and revelation, and I have sometimes wished there were more theological engagement with Scotus today. So I was delighted to discover that the new issue of Modern Theology is devoted to Scotus and to his relationship to modern theology (with a particular focus on Radical Orthodoxy). The journal features seven articles on Scotus, by Catherine Pickstock, Thomas Williams, Matthew Levering, Oliver Boulnois, Mary Beth Ingham, Emmanuel Perrier, and Kevin L. Hughes. All the articles are available online through Blackwell Synergy. Since Duns Scotus and Thomas Aquinas represent two of the three great schools of medieval theology, this special issue is the perfect complement to Modern Theology’s recent issue (20:1, 2004) on Thomas Aquinas. Now the editors will have to complete the set with an issue devoted to William of Ockham.